Do you have questions about your service-connected disability benefits? We’ve got answers. 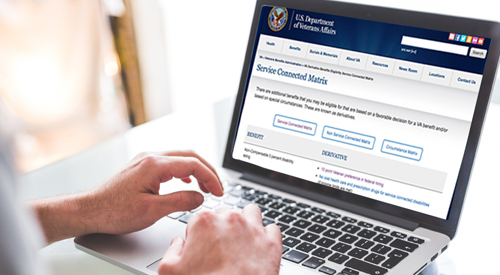 Check out the Service-Connected Benefits Eligibility Matrix to discover the benefits you’re eligible for. Simply scroll down the table until you find your rating, then look at the corresponding benefits column. Two Paths to Adapted Housing – Are You Eligible? VA provides grants to Service members and Veterans with certain permanent and total service-connected disabilities to help purchase or construct an adapted home, or modify an existing home to accommodate a disability. Find out more about the Specially Adapted Housing grant and the Special Housing Adaptation grant. Did you know you can manage your housing benefits online? With eBenefits, you can check the status of a Specially Adapted Housing grant, print a Certificate of Eligibility for a Home Loan and check the status of an open housing appeal — all from the comfort of your home. Living Overseas? You’re Still Eligible for Benefits. Veterans who live overseas remain entitled to the benefits and services earned throughout their military service. Most VA benefits are payable regardless of where you live or your nationality. Find out how to get connected to make the most of your benefits. Update your subscriptions, modify your password or email address, or stop subscriptions at any time on your Subscriber Preferences Page. You will need to use your email address to log in. For questions or problems with the subscription service, visit subscriberhelp.govdelivery.com.